During late 2004, ‘glibc malloc’ got hardened. After which techniques such as unlink got obsolete, leaving the attackers clueless. But only for some time since in late 2005, ‘Phantasmal Phatasmagoria’ came with below series of techniques to successfully exploit heap overflow. House of Mind: In this technique, attacker tricks ‘glibc malloc’ to use a fake arena constructed by him. Fake Arena is constructed in such a way that unsorted bin’s fd contains the address of GOT entry of free – 12. Thus now when vulnerable program free’s a chunk GOT entry of free is overwritten with shellcode address. After successful GOT overwrite, now when free is called by vulnerable program, shellcode would get executed!! Prerequisites: Below are the prerequisites to successfully apply house of mind since not all heap overflow vulnerable programs can be exploited using this technique. A series of malloc calls is required until a chunk’s address – when aligned to a multiple of HEAP_MAX_SIZE results in a memory area which is controlled by the attacker. This is the memory area where fake heap_info structure is found. Fake heap_info’s arena pointer ar_ptr would point to fake arena. Thus both fake arena and fake heap_info’s memory region would be controlled by the attacker. A chunk whose size field (and its arena pointer – prereq 1) controlled by the attacker should be freed. Chunk next to the above freed chunk should not be a top chunk. Vulnerable Program: This program meets the above prerequisites. Program to generate attacker data. Arena for the chunk that is getting freed is retrieved by invoking arena_for_chunk macro. arena_for_chunk: If NON_MAIN_ARENA (N) bit is not set, main arena is returned. If set, corresponding heap_info structure is accessed by aligning the chunk address to a multiple of HEAP_MAX_SIZE. Then arena pointer of the obtained heap_info structure is returned. In our case, NON_MAIN_ARENA bit is set by the attacker and hence heap_info structure (located at 0x08100000) of the chunk that is getting freed is obtained. Attacker would also have overwritten the arena pointer (of the obtained heap_info structure) in such a way that it points to the fake arena, ie) heap_info’s ar_ptr = Fake arena’s base address (ie)0x0804a018). Invoke _int_free with arena pointer and chunk address as arguments. In our case arena pointer points to fake arena. Thus fake arena and chunk address are passed as arguments to _int_free. Mutex – It should be in unlocked state. Bins – Unsorted bin’s fd should contain the address of GOT entry of free – 12. Top address should not be equal to the chunk address that is getting freed. Top address should be greater than next chunk address. System Memory – System memory should be greater than next chunk size. If chunk is non mmap’d, acquire the lock. In our case chunk is non mmap’d and fake arena’s mutex lock is acquired successfully. Find if previous chunk is free, if free consolidate. In our case previous chunk is allocated and hence it cant be consolidated backward. Find if next chunk is free, if free consolidate. In our case next chunk is allocated and hence it cant be consolidated forward. Place the currently freed chunk in unsorted bin. In our case fake arena’s unsorted bin’s fd contains the address of GOT entry of free – 12 which gets copied to ‘fwd‘ value. Later currently freed chunk’s address gets copied to ‘fwd->bk’. bk is located at offset 12 in malloc_chunk and hence 12 gets added to this ‘fwd’ value (ie) free-12+12). Thus now GOT entry of free gets modified to contain currently freed chunk address. Since the attacker has placed his shellcode in the currently freed chunk, from now on whenever free gets invoked attacker’s shellcode gets executed!! Protection: At present day, house of mind technique doesnt work since ‘glibc malloc’ has got hardened. Below check is added to prevent heap overflow using house of mind. Corrupted chunks: Unsorted bin’s first chunk’s bk pointer should point to unsorted bin. If not ‘glibc malloc’ throws up corrupted chunk error. House of Force: In this technique, attacker abuses top chunk size and tricks ‘glibc malloc’ to service a very large memory request (greater than heap system memory size) using top chunk. Now when a new malloc request is made, GOT entry of free would be overwritten with shellcode address. Hence from now on whenever free is called, shellcode gets executed!! Malloc 1: Attacker should be able to control the size of top chunk. Hence heap overflow should be possible on this allocated chunk which is physically located previous to top chunk. Malloc 2: Attacker should be able to control the size of this malloc request. Malloc 3: User input should be copied to this allocated chunk. House of force vulnerable program. argv – Shellcode + Pad + Top chunk size to be copied to first malloc chunk. argv – Size argument to second malloc chunk. argv – User input to be copied to third malloc chunk. /* Program to exploit executable 'vuln' using hof technique. Objective of very large block allocation request is after allocation, new top chunk should be located 8 bytes before the GOT entry of free. So one more malloc request (line) would help us to overwrite GOT entry of free. free is “GOT entry of free in executable ‘vuln'” ie) free = 0x08049858. top is “current top chunk (after first malloc line)” ie) top = 0x0804a108. But when attacker passes a size argument of 0xFFFFF748 ‘glibc malloc’ converts the size into usable size 0xFFFFF750 and hence now new top chunk size would be located at 0x8049858 instead of 0x8049850. Therefore instead of 0xFFFFF748 attacker should pass 0xFFFFF744 as size argument, which gets converted into usable size ‘0xFFFFF748’ as we require!! Now since in line top chunk points to 0x8049850, a memory allocation request of 256 bytes would make ‘glibc malloc’ to return 0x8049858 which gets copied to buf3. Copying buf1 address to buf3, results in GOT overwrite. Thus call to free (line) would result in shellcode execution!! House of Spirit: In this technique, attacker tricks ‘glibc malloc’ to return a chunk which resides in stack segment (instead of heap segment). This allows the attacker to overwrite ‘Return Address’ stored in the stack. Prerequisite: Below are the prerequisites to successfully apply house of spirit since not all heap overflow vulnerable programs can be exploited using this technique. A buffer overflow to overwrite a variable which contains the chunk address, returned by ‘glibc malloc’. Above chunk should be freed. Attacker should control the size of this freed chunk. He controls in such a way that its size is equal to next malloc’d chunk size. User input should be copied to the above malloc’d chunk. /* Program to exploit executable 'vuln' using hos technique. Here attacker input ‘argv’ is copied to char buffer ‘name’. Since attacker input is greater than 44, variable’s ptr1 and local_age gets overwritten with stack address and chunk size, respectively. Stack address -0xbffffdf0 – Attacker tricks ‘glibc malloc’ to return this address when line gets executed. Chunk size – 0x30 – This chunk size is used to trick ‘glibc malloc’ when line (see below) gets executed. Line: Add stack region to ‘glibc malloc’s’ fast bin. free() invokes _int_free(). Now after buffer overflow ptr1 = 0xbffffdf0 (and not 0x804aa08). Overwritten ptr1 is passed as an argument to free(). This tricks ‘glibc malloc’ to free a memory region located in stack segment. Size of this stack region that is getting freed, located at ptr1-8+4 is overwritten by the attacker as 0x30 and hence ‘glibc malloc’ treats this chunk as fast chunk ( since 48 < 64) and inserts the freed chunk at the front end of the fast binlist located at index 4.
malloc request of 40 is converted into usable size 48 by checked_request2size. Since the usable size ’48’ belongs to fast chunk, its corresponding fast bin (located at index 4) is retrieved. First chunk of the fast binlist is removed and returned to the user. The first chunk is nothing but the stack region added during line’s execution. \xb8\xfd\xff\xbf – Return Address stored in stack gets overwritten by this value. Hence after fvuln gets executed, EIP would be 0xbffffdb8 – this location contains the jmp instruction followed by a shellcode to spawn a shell!! Line  of the above program results in heap overflow. User input ‘argv’ is copied to heap buffer ‘first’ without any size restriction. Hence when the user input is greater than 666 bytes, its bounded to overwrite chunk header of the next chunk. This overflow leads to arbitrary code execution. Unlink: The main idea of this technique is to trick ‘glibc malloc’ to unlink the ‘second’ chunk. While unlinking GOT entry of free would get overwritten with shellcode address!! After successful overwrite, now when free is called by vulnerable program at line , shellcode would get executed. Not very clear? No problem, first lets see what ‘glibc malloc’ does when free gets executed. For non mmaped chunks, consolidate backward and/or forward. Find if previous chunk is free – Previous chunk is free, if current freed chunk’s PREV_INUSE (P) bit is unset. But in our case, previous chunk is allocated since ‘first”s PREV_INUSE bit is set, by default chunk previous to the very first chunk of heap memory is allocated (eventhough it doesnt exists). If free, consolidate ie) unlink (remove) the previous chunk from its binlist, add previous chunk size to current size and change the chunk pointer to point to previous chunk. But in our case previous chunk is allocated, hence unlink isnt invoked. Thus currently freed chunk ‘first’ cant be consolidated backward. Find if next chunk is free – Next chunk is free, if next-to-next chunk’s (from currently freed chunk) PREV_INUSE (P) bit is unset. To navigate to next-to-next chunk, add currently freed chunk’s size to its chunk pointer, then add next chunk’s size to next chunk pointer. In our case next-to-next chunk to currently freed ‘first’ chunk is top chunk and its PREV_INUSE bit is set. Thus next chunk ‘second’ chunk is NOT free. If free, consolidate ie) unlink (remove) the next chunk from its binlist and add next chunk size to current size. But in our case next chunk is allocated, hence unlink isnt invoked. Thus currently freed chunk ‘first’ cant be consolidated forward. Now add the consolidated chunk to unsorted bin. In our case since no consolidation happens, just add the ‘first’ chunk to unsorted bin. prev_size = even number and hence PREV_INUSE bit is unset. Find if previous chunk is free – Previous chunk is free, if current freed chunk’s PREV_INUSE (P) bit is unset. But in our case, previous chunk is allocated since ‘first”s PREV_INUSE bit is set since by default chunk previous to very first chunk of heap memory is allocated (eventhough it doesnt exists). Find if next chunk is free – Next chunk is free, if next-to-next chunk’s (from currently freed chunk) PREV_INUSE (P) bit is unset.To navigate to next-to-next chunk, add ‘currently freed chunk’s size to its chunk pointer, then add next chunk’s size to next chunk pointer. In our case next-to-next chunk to currently freed ‘first’ chunk is NOT top chunk. Next-to-next chunk is at offset -4 from ‘second’ chunk since attacker has overwritten ‘second’ chunk’s size with -4. Thus now ‘glibc malloc’ treats prev_inuse field of ‘second’ chunk as size field of next-to-next chunk. Since attacker has overwritten an even number ( ie) PREV_INUSE (P) bit is unset) in place of prev_size ‘glibc malloc’ is tricked to believe that ‘second’ chunk is free. Value of BK is copied to a location at offset 12 from FD. In our case adding 12 bytes to FD, points to GOT entry of free and hence now GOT entry of free is overwritten with shellcode address. Bingo!! Now on whenever free is invoked, shellcode gets executed!! Thus executing line  in vulnerable program results in shellcode execution. Now add the consolidated chunk to unsorted bin. Having understood the unlink technique, lets write an exploit program. /* Program to exploit 'vuln' using unlink technique. #define FUNCTION_POINTER ( 0x0804978c )         //Address of GOT entry for free function obtained using "objdump -R vuln". #define CODE_ADDRESS ( 0x0804a008 + 0x10 )      //Address of variable 'first' in vuln executable. (by statement BK->fd = FD). Hence if no jump exists shell code would get corrupted by unlink function. Executing the above program shows that a new shell is spawned!! Protection: At present day, unlink technique doesnt work since ‘glibc malloc’ has got hardened over the years. Below checks are added to prevent heap overflow using unlink technique. Double free: Freeing a chunk which is already in free state is prohibited. When attacker overwrites ‘second’ chunk’s size with -4, its PREV_INUSE bit is unset which means ‘first’ is already in free state. Hence ‘glibc malloc’ throws up double free error. Invalid next size: Next chunk size should lie between 8 bytes to arena’s total system memory. When attacker overwrites ‘second’ chunk’s size with -4, ‘glibc malloc’ throws up invalid next size error. Courrupted Double Linked list: Previous chunk’s fd and next chunk’s bk should point to currently unlinked chunk. When attacker overwrites fd and bk with free -12 and shellcode address, respectively, free and shellcode address + 8 doesnt point to currently unlinked chunk (‘second’). Hence ‘glibc malloc’ throws up corrupted double linked list error. Having landed on this page, you should know malloc uses syscalls to obtain memory from the OS. As shown in the below picture malloc invokes either brk or mmap syscall to obtain memory. brk: brk obtains memory (non zero initialized) from kernel by increasing program break location (brk). Initially start (start_brk) and end of heap segment (brk) would point to same location. When ASLR is turned off, start_brk and brk would point to end of data/bss segment (end_data). When ASLR is turned on, start_brk and brk would be equal to end of data/bss segment (end_data) plus random brk offset. Above “process virtual memory layout” picture shows start_brk is the beginning of heap segment and brk (program break) is the end of heap segment. start_brk = brk = end_data = 0x804b000. mmap: malloc uses mmap to create a private anonymous mapping segment. The primary purpose of private anonymous mapping is to allocate new memory (zero filled) and this new memory would be exclusively used by calling process. After mmap: In the below output we can observe that our memory mapping segment (b7e00000 – b7e21000 whose size is 132KB) is combined with already existing memory mapping segment (b7e21000 – b7e22000). After munmap: In the below output we can see that our memory mapping segment is unmapped ie) its corresponding memory is released to the operating system. NOTE: In our sample program executions ASLR was turned off. How heap memory is obtained from kernel? How efficiently memory is managed? Is it managed by kernel or by library or by application itself? Can heap memory be exploited? Every memory allocator claims they are fast, scalable and memory efficient!! But not all allocators can be suited well for our application. Memory hungry application’s performance largely depends on memory allocator performance. In this post, I will only talk about ‘glibc malloc’ memory allocator. In future, I am hoping to cover up other memory allocators. Throughout this post, for better understanding of ‘glibc malloc’, I will link its recent source code. So buckle up, lets get started with glibc malloc!! History: ptmalloc2 was forked from dlmalloc. After fork, threading support was added to it and got released in 2006. After its official release, ptmalloc2 got integrated into glibc source code. Once its integration, code changes were made directly to glibc malloc source code itself. Hence there could be lot of changes between ptmalloc2 and glibc’s malloc implementation. System Calls: As seen in this post malloc internally invokes either brk or mmap syscall. Threading: During early days of linux, dlmalloc was used as the default memory allocator. But later due to ptmalloc2’s threading support, it became the default memory allocator for linux. Threading support helps in improving memory allocator performance and hence application performance. In dlmalloc when two threads call malloc at the same time ONLY one thread can enter the critical section, since freelist data structure is shared among all the available threads. Hence memory allocation takes time in multi threaded applications, resulting in performance degradation. While in ptmalloc2, when two threads call malloc at the same time memory is allocated immediately since each thread maintains a separate heap segment and hence freelist data structures maintaining those heaps are also separate. This act of maintaining separate heap and freelist data structures for each thread is called per thread arena. Before malloc in main thread: In the below output we can see that there is NO heap segment yet and no per thread stack too since thread1 is not yet created. After malloc in main thread: In the below output we can see that heap segment is created and its lies just above the data segment (0804b000-0806c000), this shows heap memory is created by increasing program break location ( ie) using brk syscall). Also do note that eventhough user requested only 1000 bytes, heap memory of size 132 KB is created. This contiguous region of heap memory is called arena. Since this arena is created by main thread its called main arena. Further allocation requests keeps using this arena until it runs out of free space. When arena runs out of free space, it can grow by increasing program break location (After growing top chunk’s size is adjusted to include the extra space). Similarly arena can also shrink when there is lot of free space on top chunk. NOTE: Top chunk is the top most chunk of an arena. For further details about it, see “Top Chunk” section below. After free in main thread: In the below output we can see that when allocated memory region is freed, memory behind it doesnt get released to the operating system immediately. Allocated memory region (of size 1000 bytes) is released only to ‘glibc malloc’ library, which adds this freed block to main arenas bin (In glibc malloc, freelist datastructures are referred as bins). Later when user requests memory, ‘glibc malloc’ doesnt get new heap memory from kernel, instead it will try to find a free block in bin. And only when no free block exists, it obtains memory from kernel. Before malloc in thread1: In the below output we can see that there is NO thread1 heap segment but now thread1’s per thread stack is created. After malloc in thread1: In the below output we can see that thread1’s heap segment is created. 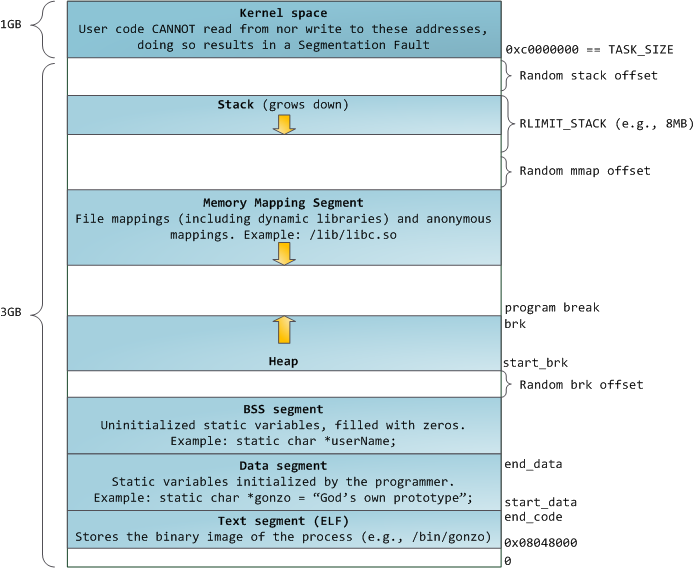 And its lies in memory mapping segment region (b7500000-b7521000 whose size is 132 KB) and hence this shows heap memory is created using mmap syscall unlike main thread (which uses sbrk). Again here, eventhough user requested only 1000 bytes, heap memory of size 1 MB is mapped to process address space. Out of these 1 MB, only for 132KB read-write permission is set and this becomes the heap memory for this thread. This contiguous region of memory (132 KB) is called thread arena. NOTE: When user request size is more than 128 KB ( lets say malloc(132*1024)) and when there is not enough space in an arena to satisfy user request, memory is allocated using mmap syscall (and NOT using sbrk) irrespective of whether a request is made from main arena or thread arena. After free in thread1: In the below output we can see that freeing allocated memory region doesnt release heap memory to the operating system. Instead allocated memory region (of size 1000 bytes) is released to ‘glibc malloc’, which adds this freed block to its thread arenas bin. Number of arena’s: In above example, we saw main thread contains main arena and thread 1 contains its own thread arena. So can there be a one to one mapping between threads and arena, irrespective of number of threads? Certainly not. An insane application can contain more number of threads (than number of cores), in such a case, having one arena per thread becomes bit expensive and useless. Hence for this reason, application’s arena limit is based on number of cores present in the system. Number of arena = 2 * number of cores. Number of arena = 8 * number of cores. Example: Lets say a multithreaded application (4 threads – Main thread + 3 user threads) runs on a 32 bit system which contains 1 core. Here no of threads (4) > 2*no of cores (2). Hence in such a case, ‘glibc malloc’ makes sure that multiple arenas are shared among all available threads. But how its shared? When main thread, calls malloc for the first time already created main arena is used without any contention. When thread 1 and thread 2 calls malloc for the first time, a new arena is created for them and its used without any contention. Until this point threads and arena have one-to-one mapping. Once loop over the available arenas, while looping try to lock that arena. If locked successfully (lets say main arena is locked successfully), return that arena to the user. If no arena is found free, block for the arena next in line. Now when thread 3 calls malloc (second time), malloc will try to use last accessed arena (main arena). If main arena is free its used else thread3 is blocked until main arena gets freed. Thus now main arena is shared among main thread and thread 3.
heap_info – Heap Header – A single thread arena can have multiple heaps. Each heap has its own header. Why multiple heaps needed? To begin with every thread arena contains ONLY one heap, but when this heap segment runs out of space, new heap (non contiguous region) gets mmap’d to this arena. malloc_chunk – Chunk Header – A heap is divided into many chunks based on user requests. Each of those chunks has its own chunk header. Main arena dont have multiple heaps and hence no heap_info structure. When main arena runs out of space, sbrk’d heap segment is extended (contiguous region) until it bumps into memory mapping segment. Unlike thread arena, main arena’s arena header isnt part of sbrk’d heap segment. Its a global variable and hence its found in libc.so’s data segment. prev_size: If the previous chunk is free, this field contains the size of previous chunk. Else if previous chunk is allocated, this field contains previous chunk’s user data. size: This field contains the size of this allocated chunk. Last 3 bits of this field contains flag information. PREV_INUSE (P) – This bit is set when previous chunk is allocated. IS_MMAPPED (M) – This bit is set when chunk is mmap’d. NON_MAIN_ARENA (N) – This bit is set when this chunk belongs to a thread arena. Other fields of malloc_chunk (like fd, bk) is NOT used for allocated chunk. Hence in place of these fields user data is stored. User requested size is converted into usable size (internal representation size) since some extra space is needed for storing malloc_chunk and also for alignment purposes. Conversion takes place in such a way that last 3 bits of usable size is never set and hence its used for storing flag information. prev_size: No two free chunks can be adjacent together. When both the chunks are free, its gets combined into one single free chunk. Hence always previous chunk to this freed chunk would be allocated and therefore prev_size contains previous chunk’s user data. size: This field contains the size of this free chunk. fd: Forward pointer – Points to next chunk in the same bin (and NOT to the next chunk present in physical memory). bk: Backward pointer – Points to previous chunk in the same bin (and NOT to the previous chunk present in physical memory). fastbinsY: This array hold fast bins. Fast Bin: Chunks of size 16 to 80 bytes is called a fast chunk. Bins holding fast chunks are called fast bins. Among all the bins, fast bins are faster in memory allocation and deallocation. Each fast bin contains a single linked list (a.k.a binlist) of free chunks. Single linked list is used since in fast bins chunks are not removed from the middle of the list. Both addition and deletion happens at the front end of the list – LIFO. Chunks inside a particular fast bin are of same sizes. During malloc initialization, maximum fast bin size is set to 64 (!80) bytes. Hence by default chunks of size 16 to 64 is categorized as fast chunks. No Coalescing – Two chunks which are free can be adjacent to each other, it doesnt get combined into single free chunk. No coalescing could result in external fragmentation but it speeds up free!! Initially fast bin max size and fast bin indices would be empty and hence eventhough user requested a fast chunk, instead of fast bin code, small bin code tries to service it. Later when its not empty, fast bin index is calculated to retrieve its corresponding binlist. First chunk from the above retrieved binlist is removed and returned to the user. Fast bin index is calculated to retrieve its corresponding binlist. This free chunk gets added at the front position of the above retrieved binlist. Unsorted Bin: When small or large chunk gets freed instead of adding them in to their respective bins, its gets added into unsorted bin. This approach gives ‘glibc malloc’ a second chance to reuse the recently freed chunks. Hence memory allocation and deallocation speeds up a bit (because of unsorted bin) since time taken to look for appropriate bin is eliminated. Unsorted bin contains a circular double linked list (a.k.a binlist) of free chunks. Chunk size – There is no size restriction, chunks of any size belongs to this bin. Small Bin: Chunks of size less than 512 bytes is called as small chunk. Bins holding small chunks are called small bins. Small bins are faster than large bins (but slower than fast bins) in memory allocation and deallocation. Each small bin contains a circular double linked list (a.k.a binlist) of free chunks. Double linked list is used since in small bins chunks are unlinked from the middle of the list. Here addition happens at the front end and deletion happens at the rear end of the list – FIFO. Chunks inside a small bin are of same sizes and hence it doesnt need to be sorted. Coalescing – Two chunks which are free cant be adjacent to each other, it gets combined into single free chunk. Coalescing eliminates external fragmentation but it slows up free!! Initially all small bins would be NULL and hence eventhough user requested a small chunk, instead of small bin code, unsorted bin code tries to service it. Also during the first call to malloc, small bin and large bin datastructures (bins) found in malloc_state is initialized ie) bins would point to itself signifying they are empty. Later when small bin is non empty, last chunk from its corresponding binlist is removed and returned to the user. While freeing this chunk, check if its previous or next chunk is free, if so coalesce ie) unlink those chunks from their respective linked lists and then add the new consolidated chunk into the beginning of unsorted bin’s linked list. Large Bin: Chunks of size greater than equal to 512 is called a large chunk. Bins holding large chunks are called large bins. Large bins are slower than small bins in memory allocation and deallocation. Each large bin contains a circular double linked list (a.k.a binlist) of free chunks. Double linked list is used since in large bins chunks are added and removed at any position (front or middle or rear). 16 bins contain binlist of chunks of size which are 512 bytes apart. 8 bins contain binlist of chunks of size which are 4096 bytes apart. 4 bins contain binlist of chunks of size which are 32768 bytes apart. 2 bins contain binlist of chunks of size which are 262144 bytes apart. 1 bin contains a chunk of remaining size. Unlike small bin, chunks inside a large bin are NOT of same size. Hence they are stored in decreasing order. Largest chunk is stored in the front end while the smallest chunk is stored in the rear end of its binlist. Coalescing – Two chunks which are free cant be adjacent to each other, it gets combined into single free chunk. Initially all large bins would be NULL and hence eventhough user requested a large chunk, instead of large bin code, next largest bin code tries to service it. User chunk (of user requested size) – returned to user. Remainder chunk (of remaining size) – added to unsorted bin. If largest chunk size (in its binlist) is lesser than user requested size, try to service user request by using the next largest (non empty) bin. Next largest bin code scans the binmaps to find the next largest bin which is non empty, if any such bin found, a suitable chunk from that binlist is retrieved, split and returned to the user. If not found, try serving user request using top chunk. free(large chunk) – Its procedure is similar to free(small chunk). The remainder chunk becomes the new top. If top chunk size is lesser than user requested size, top chunk is extended using sbrk (main arena) or mmap (thread arena) syscall. Last Remainder Chunk: Remainder from the most recent split of a small request. Last remainder chunk helps to improve locality of reference ie) consecutive malloc request of small chunks might end up being allocated close to each other. But out of the many chunks available in an arena, which chunk qualifies to be last remainder chunk? When a user request of small chunk, cannot be served by a small bin and unsorted bin, binmaps are scanned to find next largest (non empty) bin. As said earlier, on finding the next largest (non empty) bin, its split into two, user chunk gets returned to the user and remainder chunk gets added to the unsorted bin. In addition to it, it becomes the new last remainder chunk. How locality of reference is achieved? Now when user subsequently request’s a small chunk and if the last remainder chunk is the only chunk in unsorted bin, last remainder chunk is split into two, user chunk gets returned to the user and remainder chunk gets added to the unsorted bin. In addition to it, it becomes the new last remainder chunk. Thus subsequent memory allocations end up being next to each other.